Local 583’s Family Picnic will be held on July 22, 2018 at Sandy Beach Park. We will be serving hot dogs, chips, pop and ice cream. There will also be entertainment including: airbrush tattoos, a 20 foot super slide as well as outdoor games to enjoy. Also, we will have our annual prizes for youngest and oldest member as well as bicycle draws for member’s children up to age 14. Get ready with sunscreen and bug spray and come on down! The fun begins at 10 AM. Please watch for the poster in the usual posting locations. The City Manager, Jeff Fielding, continues to meet with Civic Coalition Presidents to discuss issues of common interest, the current meeting addressed respect in the workplace as a key topic. We were informed the City is taking this very seriously; to the point of hiring new staff to investigate issues. While some of those in positions of “the know” have seen a handful of high level staff leave City Hall and not return, this is not usually visible to the frontline staff. But, respect in the workplace is being investigated at the frontline level and it can be to the point of ridiculous. It can be you and your audience being observed by a third party who takes offense. It seems even the opportunity to hear from the party disrespected is lost. The disrespected party is not obliged to say they were disrespected or acknowledge it at your level, but instead it is taken higher. Local 583 thinks we need to define what respect is; returning a call or email, getting the facts straight in a discipline letter, following the CBA, giving the benefit of the doubt to a member in an investigation. We have quite a lengthy list of what respect means to Local 583, but if you have some ideas please forward them to the office. Local 583 would like to reach out to our CUPE partners at the Civic Coalition and thank them. They managed to get the City to reduce the suspension for forgetting to renew your driver’s license down to 5 days! As many of our own members know already (through the grievance sheet, newsletters and word of mouth) Local 583 had ended up at arbitration on this issue and the Arbitrator awarded discipline in the form of a 14 day suspension. The CUPE Locals were not aware of this and had actually seen the termination of some of their members. With the Local 583 arbitration award in hand they went the route of arbitration also. With 8 outstanding CUPE cases and at the 11th hour, the City agreed to the 5 day suspension as the resolve. Luckily, Local 583 still had 10 similar grievances on the books so these have all been reduced as well. It’s a shame Local 583 couldn’t get Labour Relations to stand down on the issue, with LR always citing the 14 day award. Even better news though; through the Coalition we hear there are still some progressive ranking City officials that believe the 5 day is still too harsh. We agree with them. Let’s see what Coalition Local steps up to grieve next. Local 583 is happy to report Calgary Transit is again hiring in Operations. There could be as many as 250 new Transit Operators and Community Shuttle Operators hired. This is great news after feeling our seniority stagnate for the last 18 months. Due to the large number of Community Shuttle orientation classes the Local has taken the opportunity to explain the history of Community Shuttle to the new members. We inform them about: the 1986 inception and keeping the jobs in house, the 49 day strike of 2001 in which we strived for 1 driver, 1 bus, 1 wage, the introduction of full time shifts and benefits; and the arbitration over the definition of what a Community Shuttle bus is by size, capacity and routing. This history helps to set the stage for the job they have secured. Through the current Transit Operator and Community Shuttle competitions Accessible Operators had their first chance to move to a different classification. At the start of the Operator competitions these Access Operators all had a Transit seniority date of August 24, 2015. Despite the opportunity for better wages and benefits driving conventional buses, only 3 Access Operators have chosen to move. They are a dedicated group, fully committing to the community they serve! We also understand a mandate to hire has been approved in this division. This mandate is long overdue with their current operator staffing down to approximately 86 when it was at 98 on transition day in August 2015. The Local would be remiss not to mention this is a great time to remind those who didn’t “sign up” at Orientation to join now. 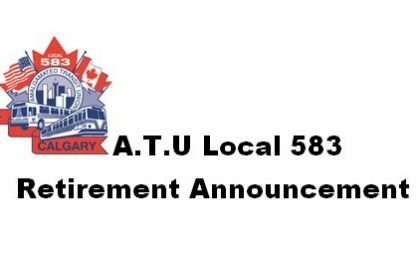 New staff occasionally ask for extra time to give due consideration to joining ATU Local 583. For those still considering we suggest the time is now. With the ever growing profile of opioids such as fentanyl, carfentanil, etc. it is very important for all of our members to be aware and NOT put yourself at risk in the workplace. On occasion working directly with the public, you could be exposed to these dangers or someone who has overdosed on such drugs. If you see a member of the public down in apparent distress, your obligation is to call for help. Do not approach the individual unless it can be determined it is safe to do so. Unless you are trained, you are not qualified or obligated to provide help other than contacting your Supervisor. Continuing on the topic of safety, a notice has come down from Management in the Maintenance area that the requirement for Personal Protective Equipment will be enforced strictly. For those working in those areas, you are obliged to wear it. For those without PPE, stay in the designated safe zones. Recently Calgary Transit put out a notice advising Operators not to open roof vents/emergency hatches. As this has been something Operators have long been allowed to do in order to get ventilation in buses, ATU 583 filed a grievance. We have also met with Management hoping to resolve this issue to everyone’s satisfaction. While the grievance is currently being held in abeyance we will continue to try and get Management to allow for the cooling and comfort of our members. We are certainly not happy with the bulletin which requests you call Control to advise them when the hatch is open on your bus. Local 583 is sure Control has plenty of work to keep them busy aside from monitoring bus hatches. Besides, you might not notice if it’s open aside from it being cooler. Some members have chosen to make risky decisions such as standing on bus seats and fareboxes to open hatches; this kind of action has led to personal injuries in the workplace and compels our employer to initiate preventative action. In this case Local 583 feels there are other less impactful solutions. The Local 583 Group Insurance Plan was recently presented with a rate increase. This is the first rate increase in many years and it is relatively small. The increase will be passed on to plan members as per the Bylaws. This action will help ensure the sustainability of our Group Insurance Plan for years to come. The new rates will go into effect in Pay Period 13 and the new rate sheet has been posted in all the usual locations for membership perusal.